Temperature is the most often-measured environmental quantity. This might be expected since most physical, electronic, chemical, mechanical and biological systems are affected by temperature. Some processes work well only within a narrow range of temperatures; certain chemical reactions, biological processes, and even electronic circuits perform best within limited temperature ranges. When these processes need to be optimized, control sys-tems that keep temperature within specified limits are often used. 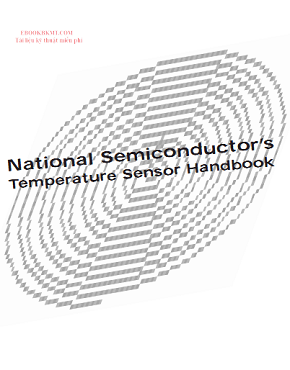 Temperature sensors provide inputs to those control systems. Many electronic components can be damaged by exposure to high temperatures, and some can be damaged by exposure to low temperatures. Semiconductor devices and LCDs (Liquid Crystal Displays) are examples of com-monly-used components that can be damage by temperature extremes. When temperature limits are exceeded, action must be taken to protect the system. In these systems, temperature sensing helps enhance reliability. One example of such a system is a personal computer. The computer’s motherboard and hard disk drive gener-ate a great deal of heat. The internal fan helps cool the system, but if the fan fails, or if airflow is blocked, sys-tem components could be permanently damaged. By sensing the temperature inside the computer’s case, high-temperature conditions can be detected and actions can be taken to reduce system temperature, or even shut the system down to avert catastrophe.